13-Jun-2014 -- While driving westward along I-80 in Nevada - returning to my home in the San Francisco Bay Area - I wasn't originally planning to visit any confluence points in Nevada. However, 41N 116W beckoned to me, because I had yet to visit it. I realized that it would take a long time (both driving and hiking) to visit this point, but I happened to have lots of time to spare, and the temperatures were also mild - in the mid 70s °F (low 20s °C). By inspecting satellite imagery (and also by reading Shawn Fleming's report, which has helped me several times in the past), I figured that the best way to reach the confluence point was to start hiking westward up the drainage that's just to the north of Swales Creek - at 40.98110°N 115.96790°W; 2.16 miles (as the crow flies) from the confluence point. This drainage makes a dog-leg to the north (at around the 116 West line of longitude), and continues northward towards the confluence point. By following this drainage, I ended up having to do no unnecessary climbing. My total hike was about 6.5 miles (so, 3.25 miles each way). I discovered later that there's a double-track road nearby - starting at 40.97886°N 115.96832°W - that runs into the drainage for about a mile. If you were to take this road, you could save up to 2 miles of total hiking time. 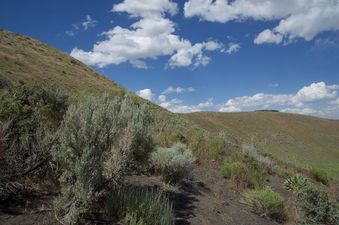 The hike to/from the confluence point was enjoyable, as was the point itself, which lies on a scenic hillside covered with patchy vegetation (with some wildflowers). This whole area is ranch land. However, about halfway towards the confluence point - at the point where the drainage starts its dog-leg to the north - there's a small fenced-off area that's marked as a "Habitat Restoration Project".